Nonconference didn't mean unimportant to Memphis coach John Calipari. For the Tigers, winning at Gonzaga was huge. Chris Douglas-Roberts provided the game-winning play, slashing across the key to hit a one-handed layup with 5.6 seconds remaining in overtime as No. 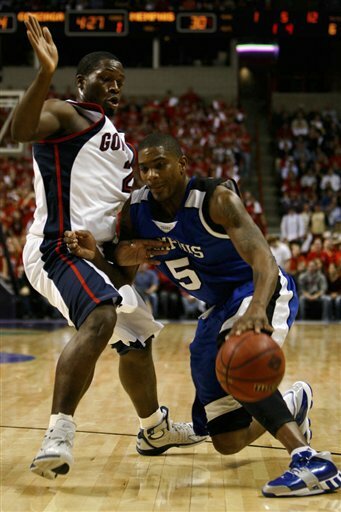 8 Memphis edged Gonzaga 78-77 on Saturday for its 15th straight victory. "We needed that win. We needed to find out who could make plays in these situations," Calipari said. Calipari's one regret was that the Tigers eased up a bit defensively in the second half, allowing Gonzaga to climb back into the game in the Spokane Veterans Memorial Arena, about a half mile from the Kennel on the Zag's campus. "Maybe I was wrong. Maybe I was holding onto the seat saying 'let's get out of here if we can,'" Calipari said. "I thought our best opportunity was to play them without fouling; don't take as many chances, guard them in the half-court." The Tigers (23-3) led 76-75 on Jeremy Hunt's 3, but Hunt fouled Abdullahi Kuso with 17.6 seconds left and Kuso sank both to put Gonzaga up 77-76. Gonzaga's Jeremy Pargo hit a jumper with a minute remaining in regulation to tie it at 69-69 after the Bulldogs trailed most of the way. Pargo's desperation shot missed from 25 feet as the overtime clock expired. Joey Dorsey led the Tigers with 15 points and 12 rebounds. Robert Dozier had 14 and Hunt and Antonio Anderson each had 12 for Memphis. "This felt like an NCAA game," Dorsey said after collecting five blocks and assuring his teammates he would provide the defense. "I told them to let their guys drive to the basket and I would block their shot," he said. "So, they depended on me to block their shots." Gonzaga's Derek Raivio led all scorers with 21 points. Pargo had 17 and David Pendergraft had 11 for Gonzaga (18-10). The Bulldogs lost their second straight game without second-leading scorer and top rebounder Josh Heytvelt, who was indefinitely suspended after his arrest on drug possession charges with redshirt freshman Theo Davis on Feb. 9. Heytvelt, a 6-foot-11 sophomore center, had averaged 15.5 points and 7.7 rebounds per game. Memphis forced 18 turnovers with its pressing defense, resulting in 15 points off turnovers, and Douglas-Roberts finished with 13 points. Anderson scored eight of the Tigers' first 10 points after the half, as Memphis took a 49-40 lead. The Bulldogs relied on 3s to claw back down the stretch to trail 69-67 with 1:46 remaining. Gonzaga stayed with the Tigers for most of the first half, trailing by 30-29 after Pargo scored with 3:02 remaining. Douglas-Roberts responded with a jumper to go up 32-29 as the Tigers went on a 9-2 scoring run. Gonzaga coach Mark Few was awed by the fleet Tigers. "By far and away they were the most athletic team we have faced this year," he said. Gonzaga turned the ball over 15 times in the first half, but tightened in the second, losing only three. "We shored that up. We did a good job of taking care of the ball in the second half," Few said. "We did a few different things. We mostly just got a tougher mind-set." Conference USA-leading Memphis hit 43 percent from the field, while Gonzaga connected on 48 percent. But the Tigers hit 17-of-27 free throws, while the Bulldogs, with four players in foul trouble, made 7-of-10. Gonzaga, which has lost 10 games for the first time since the 1997-98 season, has lost two in a row. It fell out of first place in the West Coast Conference with a home loss Monday to Santa Clara to fall to 8-3 in conference. It was the first back-to-back loss by Gonzaga in Spokane since Santa Clara and Saint Mary's defeated the Bulldogs in January 1995.